Looking for the best air purifier for cigarette & cigar smoke? In this in-depth buying guide, we review the best air purifiers for cigarette and cigar smoke, comparing them on their best features, limitations, price, filtration performance/stages and room capacity. While many of our top picks will remove a wide range of contaminants from indoor air, they have certain features and capabilities that make them especially good for cigarette smoke and smell. Most of these units are HEPA air purifiers (which can remove finest of smoke particles) and include activated carbon filters (best at removing odors). This buying guide is for anyone who smokes, who lives with a smoker or regularly has smokers over to visit. If your family and friends' smoking bother you or you are concerned about the health impact of secondary smoke, keep reading this guide to find the best air purifier for your budget, needs and room size. Why Buy an Air Purifier for Cigar and Cigarette Smoke? 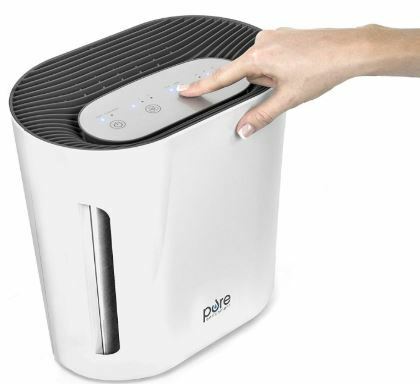 It removes 99.97% of dust, mold spores, pet dander and other allergens from the air using a HEPA Filter. It can filter out particles as small as 0.3 microns. Most of the particles in tobacco smoke are well over this size, making this purifier great for removing cigarette smoke. It kills or neutralizes airborne microbes using UV-C light. This is a type of ultraviolet radiation that is commonly used to sterilize water, medical equipment, and food. Your indoor will not only be free of allergens and tobacco smoke; you’ll also not be breathing in harmful bacteria and viruses. It removes cigarette odor and other household smells using a charcoal filter. 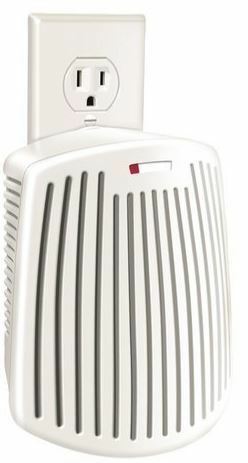 The GermGuardian AC4825 air purifier is ideal for cleaning the air in small and medium-sized rooms of up to 167 square feet - perfect for home offices, the nursery and bedrooms. Because of its light and compact design (it’s only 22” tall), you can easily carry it around from room to room. There are three fan speeds to choose from. The highest speed is ideal when you want to get rid of cigarette smoke quickly. The lowest speed is ideal when you want the purifier to be quiet. Maintenance is straightforward: just replace the filter every 6-8 months. There is a filter-change indicator to remind you, in case you forget. 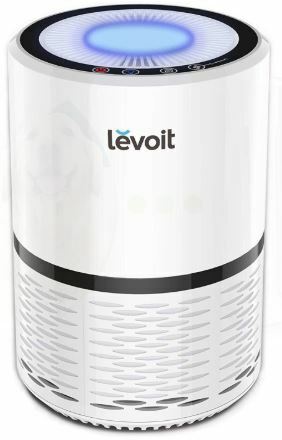 The LV-H132 air purifier uses a 3-stage filtration process to remove cigarette smoke and allergens from indoor air - and it looks good doing it. 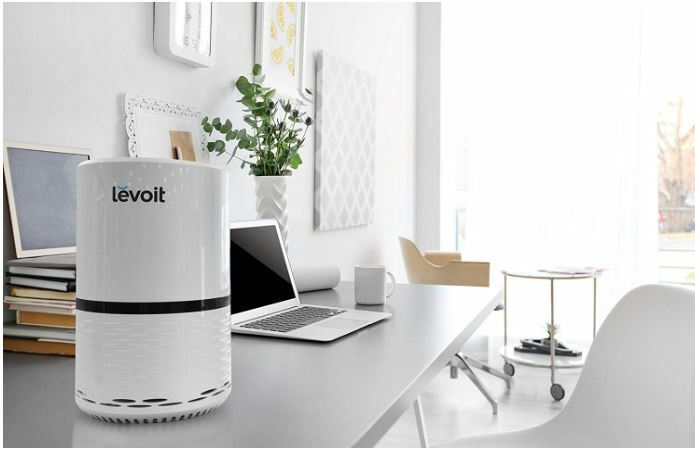 The compact air purifier has a sleek modern style that looks great on the coffee table, bedside, your work desk or even on the floor. It looks like a cylinder with a mostly white and black finish. The buttons to control various settings are at the top where you’ll also find the calming night light. 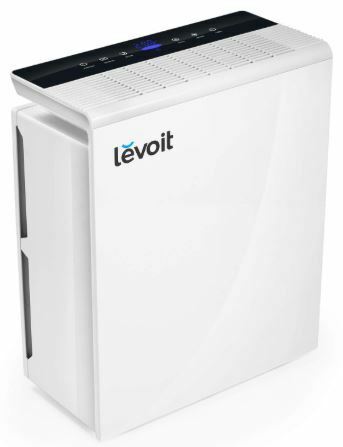 Beyond the aesthetics, the LV-H132 has three levels of filtration to ensure your indoor air is clean and fresh. 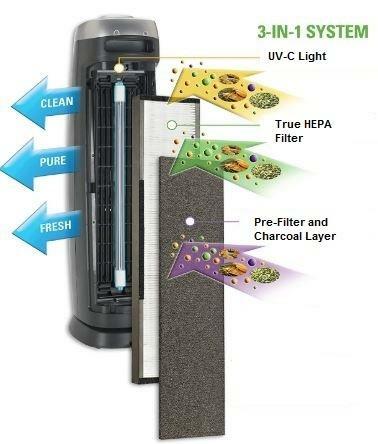 A pre-filter captures large particles like pet hair, dust and pollen. It also neutralizes airborne bacteria, fungi and mold spores. The pre-filter also keeps the HEPA filter from clogging too quickly, thus improving its efficiency and prolonging its lifespan. Next is a true HEPA filter that deals with the tiniest of airborne particles as small as 0.3 microns. This is where cigarette smoke particles are trapped as well as various allergens like dust mites and mold. Finally, a coconut shell activated carbon filter removes cigarette smells plus common household odors associated with cooking and pets. There are three fan speeds for different situations. When you need quicker purification, increase the fan speed. At night, lower the fan speed to make the unit quieter. You can also turn on the relaxing night light using on the buttons at the top. The manufacturer recommends replacing the filter every 6 months. There’s an indicator at the top that lights up when it’s time. 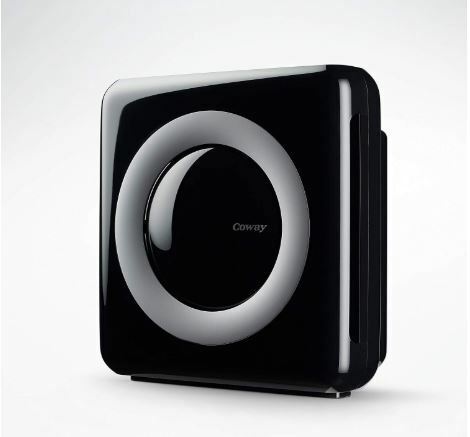 If you are looking for an air purifier that can cover a medium or large room, I recommend this one by Coway. The modern-style unit can cover a room size of up to 528 square feet. That’s about the size of a large bedroom or an open-concept living area. It is a bit more expensive than most of the air purifiers we have reviewed but that’s because it has more coverage. It also has improved purification performance thanks to its 4-stage filtration process. Here’s how it works. Washable pre-filter traps the large particles like fur, pet hair, and dust. A deodorization filter removes bad odors, small particles and harmful gasses from the air. A True HEPA filter removes tiny particles as small as 0.3 microns including cigarette smoke, mold spores, pet dander, and other contaminants. Finally, an ionizer emits negative ions to enhance air purification and keep your indoor air fresh. The buttons to control the fan speed (there are three levels), the ionizer, the timer (1h, 4hrs, 8hrs) and filter reset are set along the top. This is also where you’ll find the air quality indicator. It tells you how dirty your indoor air is using colored lights. Another feature we love is the Eco Mode. When in this mode, the air purifier will automatically stop the fan when the air gets clean to save energy. This one is a ​dedicated odor eliminator. If your biggest concern is the cigarette smoke and smell – and not allergens or airborne bacteria – then this is the best choice. It’s a small unit measuring 8.5” by 8.5” by 10”. Weighing only 4 pounds, you can carry it with you to any room. You can even travel with it and use it in smelly hotel rooms. To maximize its odor-eliminating powers, it is equipped with three carbon filters. The purifier also comes with a scent cartridge to add a fresh smell to your indoor air. As well as removing cigarette smoke, this air purifier is also great for homes with pets. It eliminates odors coming from the litter, pet food and the pet themselves. The carbon filters also capture some of the dust and allergens in the air. But if you have allergies, I recommend getting a second HEPA filter specifically to remove allergens. The unit has a 2-speed switch to vary how quickly air flows in and out of the vents. Select the lower speed when you need some quiet and the higher one to get rid of cigarette smell in the room quickly. A single unit is only enough for a 100 square feet room. For bigger spaces, you may need to buy two or more. Not very effective against dust and allergens. The LV-PUR131 is the slightly pricier sibling to the LV-H132. While the LV-H132 is notable for its sleek cylindrical shape, the LV-PUR131 has a bigger and boxier design. It’s more powerful with maximum coverage of 322 square feet. This makes it ideal for medium and large spaces. The filtration process is the same. The air passes through three filters to remove allergens and odors. A pre-filter removes pet dander, hair, dust, bacteria, mold, and fungi from the air. A true HEPA filter targets the smallest of particles (0.3 microns and larger) including cigarette smoke, fine dust, pollen, pet dander, and other allergens. An activated carbon filter then removes any odors from cooking, smoking, and pets. The control buttons are conveniently located along the top of the unit. Here you can increase or lower the fan speed, activate the auto mode and set the timer. There is also a real-time air quality indicator that tells you how clean your indoor air is. There are four color-coded stages from bad (red) to very good (blue). If you’ve activated the auto mode, the purifier will vary fan speed automatically depending on the air quality. If the indicator is red, you’ll notice that the fan is running faster. If it is green or blue, it will be quieter. There are issues with the reset button. Some customers say it doesn’t respond. 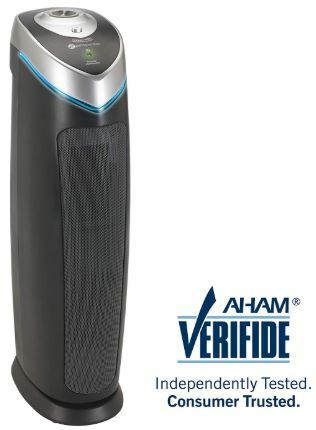 This is another excellent choice if you are looking for an air purifier that includes a UV-C sanitizer. The PureZone has four levels of filtration. Pre-filter traps the largest particles including pet hair, dust and fur. A HEPA filter then removes the remaining fine particles. It’s able to capture 99.97% of particles larger than 0.3 microns. This includes most of the particles found in cigarette smoke. An activated carbon filter removes the cigarette smell and other odors caused by pets, cooking and other household activities. The air then passes through a UV-C light sanitizer. Here, airborne microbes are killed or inactivated by the ultraviolet radiation. 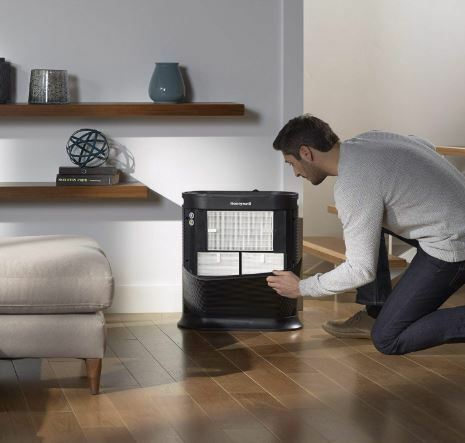 The air purifier is rated for rooms of up to 200 square feet. If you want to use it in a larger room such as an open-concept living area, consider buying two units and setting them up on each side of the room. 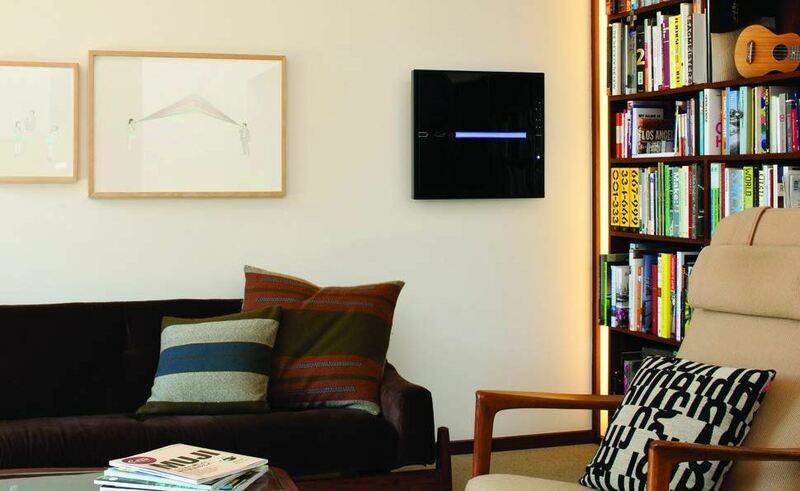 The fan has three-speed options, letting you control how quickly air flows through it and the noise level. Increase the speed when you want to get rid of cigarette smoke or other allergens quickly. Lower the speed at night to reduce the noise. There is also a timer setting. Options include 2, 4 and 8 hours. You can also leave the air purifier to run continuously. 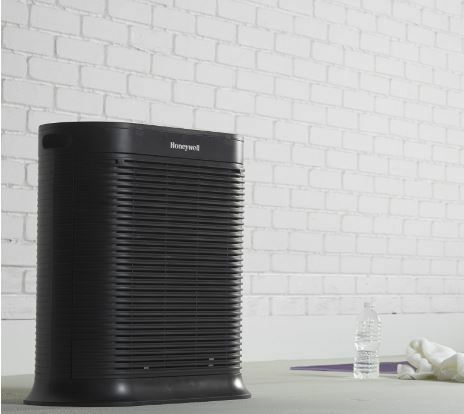 The unique feature about the Honeywell 50255B air purifier is its 360-degree air intake and discharge. Unlike most air purifiers that have intake vents on one side and outlet vents on the other, this cylindrical air purifier takes in air from all direction and emits fresh air in all directions. This not only increases purification performance, but it also ensures everyone in the room is breathing in clean, healthy air. It also allows the filter to remove cigarette smoke coming from any direction quickly. The purifier has two integrated filters: an activated carbon pre-filter to capture large particles like hair and reduce odors and a HEPA filter that traps suspended particles and allergens as small as 0.3 microns. Filter indicators remind you when it’s time to change the filters. There’s one for the pre-filter and another for the HEPA filter. The filter is rated for medium and large rooms of up to 390 square feet. The powerful fan drives about 23 air changes per hour in a small room (around 80 square feet), 12 air changes per hour in a medium room and 5 changes power hour in a large room. The fan can be pretty loud when it is in Turbo mode, the highest speed level. But it purifies air faster and more efficiently at that level. If the air isn’t too dirty, switch to the quieter day mode. At night, select sleep mode for an almost silent operation. 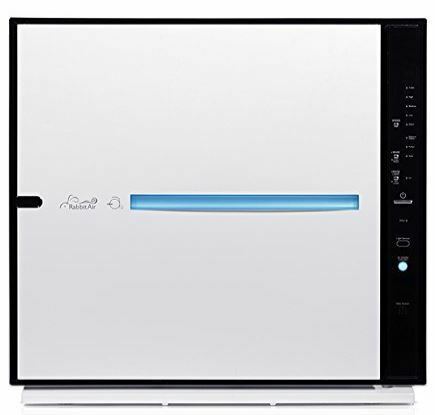 The RabbitAir Minus A2 is one of the best air purifiers for cigarette smoke. It uses 6 levels of filtration and cleans extra-large spaces of up to 815 square feet - it is also ultra-quiet. You can even control it using your smartphone (over WiFi). That said, it’s not cheap. But if you don’t mind spending more money, the Minus A2 air purifier will serve you well for years. One thing you’ll notice when you open the box is how beautiful it looks. It has a sleek modern finish that adds to the room’s décor. It’s not just a functional box you hide in a corner. You can mount it on the wall, too. It is the only full-size wall mountable air purifier I have come across. The RabbitAir A2 is well made, too. To back up the quality of their product, the manufacturer provides a 5-year warranty. The RabbitAir MinusA2 incorporates brushless motors, which make this unit extremely quiet. Most air purifiers make a ruckus when turned on to the highest fan speed. But the Rabbit Air runs along at a serene 51.3 decibels at the highest speed setting. You make it much quieter by selecting one of the other 4 speeds. At the lowest speed, the fan is practically inaudible at 21 db (about as loud as a whisper). For the customized filter, you select which one you want depending on which contaminants you want to target. For cigarette smoke, I recommend the odor remover filter. If you love the powerful coverage of the Rabbit Air MinusA2 but don’t like its style or some other feature, the Healthmate HM400 from Austin Air is a great alternative. The Healthmate is about as pricey as the Minus A2, but you get more features and slightly better performance. Style-wise, the Healthmate HM400 has a boxy suitcase look with caster wheels. It has a nice retro yet modern style that I think most will love. The fan speed setting is a classic dial that lets you select from the three fan speeds. We especially love the 360-degree intake design. It greatly improves filtration efficiency and performance. a HEPA filter for the smallest of allergens and smoke particles. 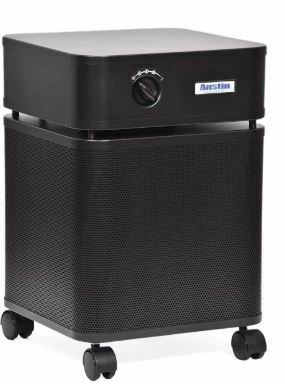 Extremely durable – it has a 23 gauge steel housing (most air purifiers have a plastic exterior). Despite its size and weight, it’s easy to move from room to room using the casters. A common concern when buying an air purifier with air-freshening technology is the emission of ozone. Most ‘air-freshening’ purifiers use an ionizer that produces negative ions along with a small amount of ozone. If that worries you, the Winix 5500-2 does same thing without releasing ozone - using what they call their PlasmaWave® Technology. This involves the use of electric pulses to produce both negative and positive ions. These ions combine with water vapor in the air to form hydroxyl radicals. These radicals neutralize airborne bacteria, viruses, VOCs and chemicals. This technology is approved by the California Air Resources Board to be safe for home use. You can read more about PlasmaWave here. In addition to its PlasmaWave air sanitizer, the Winix air purifier also uses a carbon filter to remove odors and a True HEPA to remove 99.97% of allergens. There are 4 fan speeds to choose from low to turbo. You can also select an auto mode that automatically varies fan speed based on current air quality. When the unit's smart sensors detect pollution – e.g. if someone starts smoking – it will automatically increase fan speed to clean the air. At any time you can see the air quality yourself using the color-coded indicator on the unit. 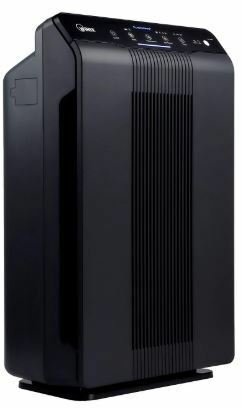 The Winix air purifier is rated for medium-size rooms of up to 360 square feet. Here’s what the CDC says about secondhand smoke. One estimate puts the number of adults who’ve died from secondhand smoke since 1964 at 2.5 million. Second-hand smoke carries hundreds of toxic chemicals that can cause cancer and other complications including heart disease and respiratory problems. These noxious fumes are especially terrible for infants, children, and pregnant mothers. The best way to protect your family from second-hand smoking is to ask the smoker to quit or do it as far away from the house as possible. But that’s not always possible. In some cases, the smoke is from a neighboring house or apartment. Buying an air purifier for cigar and cigarette smoke is not just for making the air fresher and less smelly; it’s a matter of life and death especially if you have kids around. Buy a good quality HEPA air filter that also contains an activated carbon filter to trap most of the particles in the smoke. The most important thing when buying an air purifier for smoke is to check that it has the right kind of filter. Here are different types of filters you’ll come across. HEPA Filters: The best for cigarette smoke. They can capture most toxic particles, preventing them from circulating in the air. HEPA air purifiers used to be expensive but they’ve gotten more affordable. Activated carbon filters: These filters use a type of treated charcoal to trap molecules of gasses and smells. An activated carbon filter is highly effective at getting rid of the tobacco smell. UV filter: This filter uses UV light to kill airborne bacteria and viruses. It’s good for sanitizing the air but it is ineffective against cigarette smoke. Ionizer: An ionizer or negative ion generator produces negative ions to neutralize airborne microbes and freshen the air. It’s good for cleaning up the air but has no effect on cigarette smoke. The best air purifier for smokers is one that combines several filters to provide complete all-round purification. At the very least, the purifier should have an activated carbon filter and a HEPA filter. Air purifiers don’t require any installation. Most are stand-alone units that you set up on the desk, bedside table or floor. You then press the ON button, select your preferred fan speed and that’s it. Maintenance is just as easy. You just need to remember to change the filters after the period prescribed in the manual. It’s 6-12 months for most filters. Some air purifiers have a convenient filter change reminder that saves you the trouble of having to track how long you’ve been using the current filter. If your air purifier has a pre-filter check whether it is washable, most don’t need to be replaced. Just wash it under a running tap, let it dry and then put it back. But for HEPA and carbon filters, you have to replace them after a while. 7 x 10.2 x 21.5"
8.5 x 8.5 x 14.5"
16.8 x 9.6 x 18.3"
18.1 x 10.8 x 16.4"
14.5 x 7.2 x 18.5"
13.5 x 12.1 x 8.2"
18 x 18 x 19.6"
Up to 390 sq. ft.
24 x 22.8 x 9.8"
Up to 815 sq. ft.
14.5 x 14.5 x 23"
15 x 8.2 x 23.6"
Up to 360 sq. ft.
A HEPA filter must meet certain air purification standards to earn that recognition. 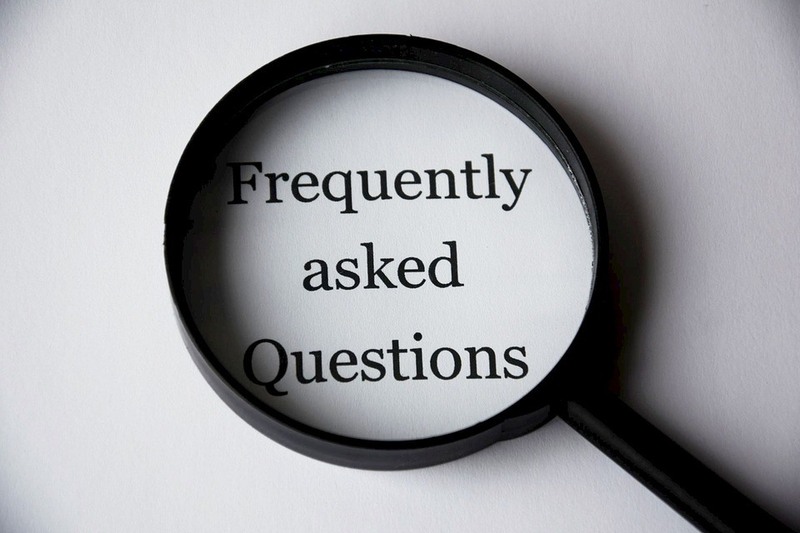 The most notable standard is that a HEPA filter must remove 99.97% of particles greater or equal to 0.3 microns from the air passing through it. This is why HEPA filters are common in air purifiers. They are very good at cleaning up the air. They can remove both large and fine allergens and particles. Activated carbon is charcoal that has been treated, usually by heating, to make it more porous. The added porosity makes the material better at absorbing molecules of substances that pass through it. When air passes through activated carbon, molecules of certain gasses and smells are trapped in the highly porous filter. That’s why activated carbon is very good at removing unpleasant odors from the air. Why is cigarette smoke so essential to get rid of? If you breathe in second-hand cigarette smoke, you are taking in most of the chemicals the smoker is also taking in. Secondhand smokers are at an increased risk of cancer, respiratory complications and heart disease among other problems. Infants, children and pregnant mothers are at the highest risk. Can an air purifier completely get rid of cigarette smoke? Many gaseous toxins in cigarette smoke have molecules too small for even HEPA filters. Even if the air purifier gets rid of the smell, there may still be some chemicals around the air. That’s why the best solution is to ask the smoker to move far away. How are air purifiers designed to filter cigarette smoke? The smoke-containing air is drawn into the air purifier by a fan. It is passed through a series of filters designed to trap many of the harmful particles in smoke. The cleaner air is then forced out and spread around the room. How do you reduce the smell of cigarette smoke? Buy an air purifier that contains an activated carbon filter. It is best for removing the smell of cigarette smoke. If the smoke is coming from a neighbor, consider sealing off hidden entry points. What is the best solution for avoiding cigarette smoke? A good quality HEPA air purifier helps but not 100%. The best solution for your family’s health is to change the environment completely. Either ask the smoker to quit or smoke far far away from the house or move to a smoke-free neighborhood.